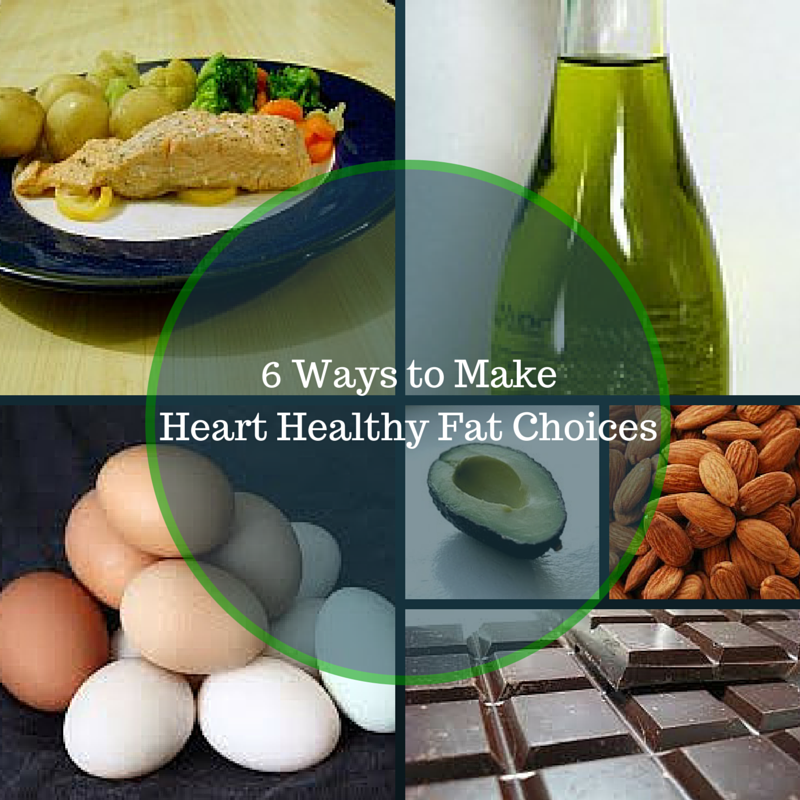 Realize that dietary fat (and especially certain types of fat) is more harmful to your heart than cholesterol is. Eggs are not the enemy! In fact, eggs contain certain heart healthy nutrients, including protein, vitamins B12 and D, folate, and riboflavin. Whenever possible, cook your eggs with extra virgin olive oil to increase the heart health factor. Regarding types of fat, it is best to substitute mono- and polyunsaturated fats for saturated fats, whenever possible. Saturated fats include butter and other full-fat dairy products, red meat, and many processed foods (some of which are also high in trans fats—a special kind of fat that is made by the addition of hydrogen molecules to keep the fat solid—which does nasty things inside the human body). Unsaturated fats include plant-based oils, such as peanut oil, sunflower oil, and olive oil. Avocados are delicious fruits that contain mostly unsaturated fat. In addition to this, they are cholesterol and sodium free. Avocados (or the avocado-based spread, guacamole) can be a fantastic substitute in food items that normally require mayonnaise; for example, deviled eggs, sandwiches, tuna salad, or even potato salad. Eat more nuts, if you are not allergic (but avoid peanuts, as they are higher in saturated fat than other kinds of nuts). The best nuts for overall heart health are macadamia nuts, walnuts, and almonds. In addition to heart healthy fat, these nuts include high amounts of fiber and some Omega-3 fatty acids, which lower LDL cholesterol and reduce the risk of blood vessel blockages and clots. Add more fish to your diet, especially salmon. That’s one of nature’s best sources of Omega-3 fatty acids. If you’re like me, you don’t eat nearly enough fish. It’s recommended that you eat it at least twice a week—more often, if at all possible. However, if you are pregnant or breastfeeding, you’ll want to avoid eating a lot of fish high in mercury, such as tuna and most shellfish. Cutting down on fat doesn’t mean you have to completely deny your sweet tooth. But dark chocolate should always be preferred over milk chocolate. Dark chocolate contains numerous anti-inflammatory agents that can reduce swelling and minimize heart disease risk. Plus, it has much less sugar than does milk chocolate, so it will create less of a carbohydrate load for your body, which may reduce your risks of developing both obesity and diabetes. Sometimes the bitterness of the dark chocolate takes a while to get used to, but it can be well worth the switch. Keep in mind also that, as is the case with every food, moderation is the key here. It’s recommended to eat a full bar of chocolate over the course of one week for best health results. And if it’s not obvious enough by now that you can still eat delicious food while trying to maintain the health of your heart, you can sign up for my email list to get instant access to my special free report: 30 Budget-Friendly Heart Healthy Recipes. That’s enough for a whole month! Egg yolks, however, should be avoided by those who have difficulty controlling their LDL and total cholesterol levels. Also, those who already have heart disease and/or diabetes should limit their egg yolk intake to no more than three per week. Some butter, in moderation, is perfectly acceptable, and some studies show that it may actually lower your risk of heart disease (because of its high nutrient and omega-3 fatty acid content) compared to its synthetic counterpart, margarine. However, the key word there is moderation. You don’t want to eat a pound of butter a day. And it’s always better to substitute plant-based oils, whenever possible. Coconut oil is one plant-based oil that is high in saturated fat; however, studies have shown that it (the virgin, unprocessed version) can help lower bad (LDL) and raise good (HDL) cholesterol, if consumed in moderation.